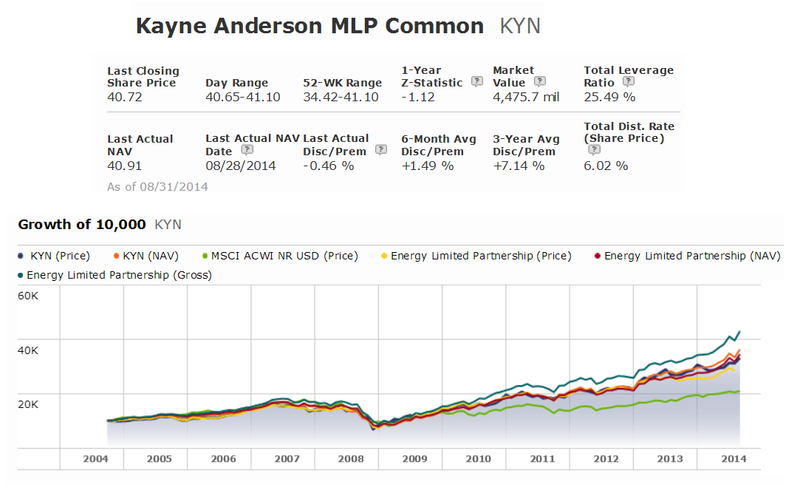 This Kayne Anderson MLP Fund (KYN) objective is to seek a high total return. It invest most of its assets through investment in energy related MLPs (master limited partnerships) and other industrial transport companies. This MLB fund is a leveraged, tax-paying closed end fund. This US stock fund has a dividend yield of 6.02%. This distribution rate is paid every quarter. The fund managers are J.C. Frey and Kevin S McCarthy since 2004. The current share price is $41.02. Its net asset value is $40.91. The fund sponsor is Kayne Anderson Capital Advisors LP. The annual expense ratio fee is 2.61%. Morningstar has ranked this MLP fund with 4 stars and bronze rating. In 2014, the year to date return is 8.42%. This Kayne Anderson MLP common has returned 22.58% over the past 1 year, 21.90% over the past 3 years, and 24.05% over the past 5 year. This stock fund has 71 holdings in its portfolio. The annual portfolio turnover rate is 21.20%. Top 5 stocks in its holdings are Enterprise Products Partners LP – EPD (12.09%), Regency Energy – RGP (7.35%), Williams Partners LP – WPZ (6.96%), Plains All American Pipeline LP – PAA (6.89%), and Energy Transfer Partners, L.P. – ETP (6.64%). Closed end funds (CEFs) are traded like stocks or ETFs (Exchange Traded Funds). You can buy from your stock brokers including TD Ameritrade, Fidelity, ETrade, Interactive Brokers, etc. Invest with as little as 1 share is possible. This stock fund has great performance for the past 5 years. High yield can provide income for investors. Kayne Anderson MLP has high expense fee. It is a leveraged fund.